1.8 How should we take senna? 1.9 When should we take senna preparations? 1.10 What about whole bread with senna seeds? 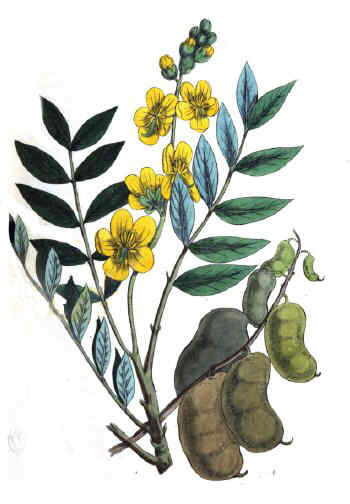 – Cassia acutifolia Delile, Cassia orientalis Pers., Senna acutifolia Batka, Cassia Senna L.; Senna alexandrina Mill. ; Cassia lanceolata Forssk. Some authors consider that the two previous species are, in fact different varieties of senna. Other authors prefer to consider them different species. 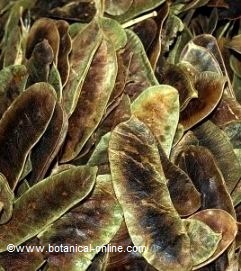 It seems that Alexandrian Senna has stronger properties than that of India, for its higher content of active ingredients. In any case, preparation from “senna leaves” are usually a mixture of the two varieties or species. Habitat: It grows naturally in tropical countries in Africa and India. You can see plenty on the banks of the Nile and in the region of Nubia (very arid region of Northwest Africa). It is grown especially in Egypt and Sudan. Perennial bush, a little more than half a meter tall, with sticky texture and characteristic odor. Stem: erect, smooth, light green. Leaves compound with 4 or 8 pairs of leaflets oblong or lanceolate with strong ribs on the underside, almost sessile, yellowish green. Yellow flowers, gathered together in terminal clusters, long fruit (a legume), grayish brown, dehiscent, about 2 cm wide and 4 to 7 long, very flat. It usually contains about 6 seeds. Traditional use: Senna leaves have traditionally been used as a major resource for the treatment of constipation. This plant is still the most widely used in Africa for this purpose. Senna belongs to the group of stimulant laxatives and cathartics, within which we have other plants with similar properties as rhubarb, cascara sagrada (Rhamnus purshiana) or alder buckthorn (Rhamnus frangula). Peristalsis produced by this type of laxative is due in part by increased production of mucus in the intestinal wall and, moreover, by a greater accumulation of fluid in the intestine. This promotes the evacuation of accumulated feces in the intestine. (mainly sennosides, aloe-emodin and rhein) from which Alexandrian Senna (Cassia acutifolia) is the species with the highest proportion and the one with the most potent laxative or purgative effects. How should we take senna? Although the leaves or pods of Cassia can be infused, the most common way is to take a preparation which is sold commercially. It is a plant with a very bitter taste and also, when taken alone, it usually produces cramps or abdominal discomfort. This determines that it is not often used alone, but it becomes part of many laxative preparations together with other herbs. Typically, such preparations usually contain peppermint leaves, fennel, ginger, bits of orange peel, coriander and other natural products to provide it better taste and relax the intestines, thereby decreasing the likelihood of adverse effects. The most common is to take the preparation, according to the instructions of the prospectus, before going to sleep, to get the results the following morning. Although the effects of this plant are highly dependent on each person, they may appear between 4 and 12 hours after ingestion. The anthraquinones are eliminated in the urine, which can tinge it yellow or red brown. When should we take senna preparations? In principle all stimulant laxatives should only be taken when no other remedy has proved to be effective. Regular use may produce a “lazy colon” used to work only when you supply this type of drug. There are countless people who have developed this kind of dependence on this laxative and have many problems with constipation regularly, so they are forced to take cassia, senna or cascara to defecate. On the other hand, there are studies that seem to suggest that regular use of this plant may favor the development of cancerous tumors. Sometimes in special circumstances is necessary to use cassia, such as in patients with hemorrhoids facing with serious problems, such as after surgery, rectal interventions, etc. Anyway, it is advised to use this plant in a non longer treatment than a week or ten days. It would also be wise to consult a doctor before using it. What about whole bread with senna seeds? The use of senna seeds in whole bread and pastry has become usual in Western society. It is sold without prescription in bakeries or supermarkets. This has led to abuse of this type of bread by people who have got their bodies used to indiscriminate use of this plant. Like the other products made with senna, this bread should only be taken when the doctor advises and for short periods of time. More information on cassia toxicity, contraindications and side effects.